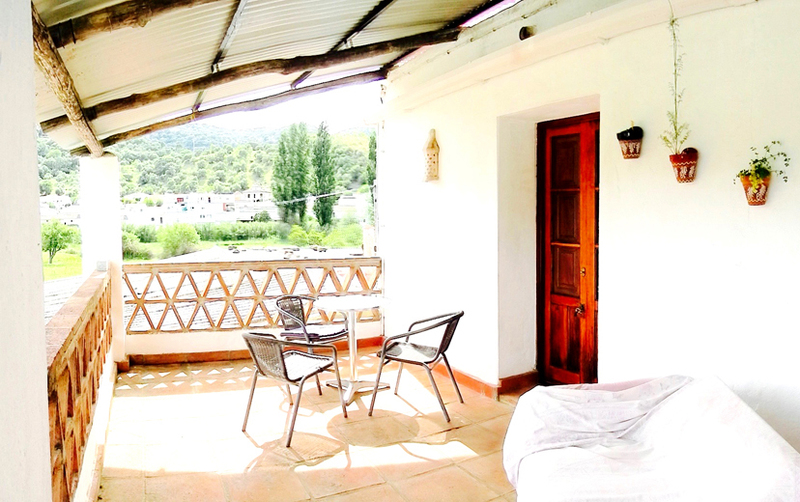 Our two studio apartments are situated above the main house with wonderful views of the surrounding mountains. Each apartment has its own shaded terrace that is perfect for relaxing, reading a book or dining al fresco. 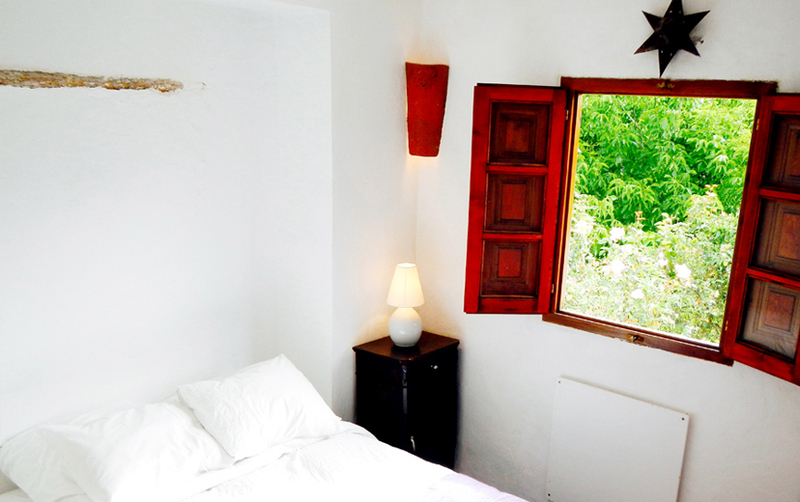 Our en-suite bedroom, El Cuartón, is on the ground floor just a skip away from the swimming pool. Our swimming pool is set beside a shaded pergola in the garden and you can relax under the walnut tree and sample some of the fresh plums, figs or pomegranates, depending on the season. There is a paella and plancha stand which you are welcome to use if you would like to cook outside. There are lovely walks through the countryside which are perfect for all levels of fitness and you will often meet little black pigs foraging under the trees and hear bells chiming in the distance as the goats graze under the olive trees. The train station is a short walk away if you would like to take a trip into Ronda or further afield. Located above the main house, this spacious studio has a shaded patio area which is perfect for relaxing and enjoying a cool drink while enjoying the beautiful views. There is a living room/kitchen, full bathroom and comfortable bedroom. An additional single bed or travel cot can be added for a child. 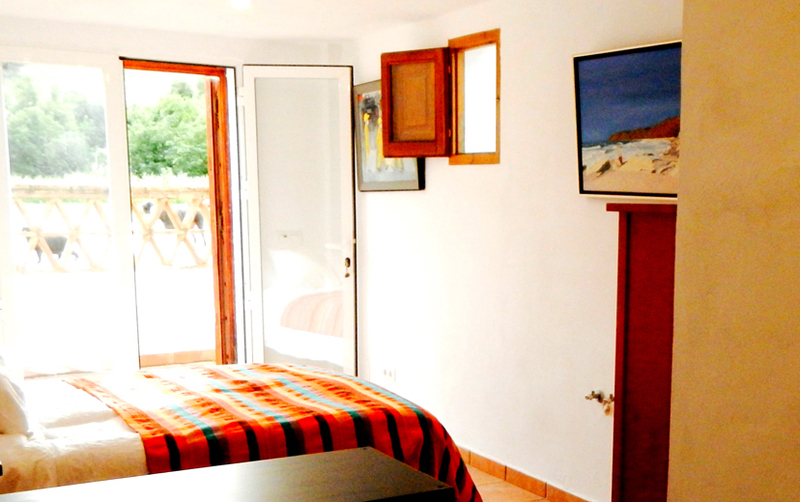 Studio Paqui is perfect for a couple or a solo traveller and has two small terraces. The compact kitchenette is perfect for making simple meals, there’s a full bathroom and the extra big bed looks out onto great views! Enjoy the pool, go for a stroll to the local village for a tapas. El Cuartón is a spacious, comfortable en-suite bedroom which is perfect for a solo traveller, a couple or a couple with a child. Shaded by our beautiful bay tree, it is just a step away from the swimming pool and the comfortable pergola in the garden. Welcome to our guest accommodation in the Guadiaro Valley. We are delighted to be able to offer you a wonderful holiday in a truly beautiful part of Spain. Nestled between the Natural Parks of Grazalema and Alcornocales and just beside the little village of La Cañada del Real Tesoro, also known as Estación de Cortes de la Frontera, this valley is a haven for all sorts of birds and animals and is home to magnificent olive, cork and oak trees. This is a holiday experience which combines the tranquility of the Spanish countryside with the opportunity of taking the car or train and exploring the cities and the coast of Andalucia. Most main tourist destinations in the area are an easy drive away which means that you can take a day trips to Seville, Cadiz, Malaga or Gibraltar. Don't forget that we are just one hour to the coast where you can enjoy a dip in the Mediterranean or you can head to the Costa de la Luz where you will find great towns like Tarifa, a wonderful spot for whale and dolphin-watching, kite-surfing or just chilling. We are just a 10-minute walk from the little village of La Cañada del Real Tesoro which has all the basic amenities: bars, restaurants, bakery, butchers, a small supermarket and the train station. A further 6kms up the hill is the 'pueblo blanco' of Cortes de la Frontera where you will find more services, including a post office and banks as well a bi-weekly market and lots of great tapas bars.